It’s a super-easy cookie recipe and it looks good, thanks to the chocolate chips and nuts you sprinkle on top. That means you save yourself the step of frosting. But I like making the brownies version because it makes it look like you get more. Extra tip: these brownies freeze well. Make a few extra batches to use up zucchini, store them in airtight containers in the freezer, and label them. You’ll be glad you did when it comes time to make school lunches. Preheat oven to 350º F. Line a 15 x 10 jelly roll baking pan with aluminum foil, allowing ends of foil to extend over two sides of the pan. Coat the foil lightly with vegetable spray. Combine the all-purpose flour, cocoa powder, baking soda, and salt together in a medium bowl. Set aside. Use a grater to grate the zucchini. Set the grated zucchini in colander in the sink. Use a potato masher to press out excess water. (You can also squeeze excess moisture from zucchini with clean hands or blot it on paper towels.) 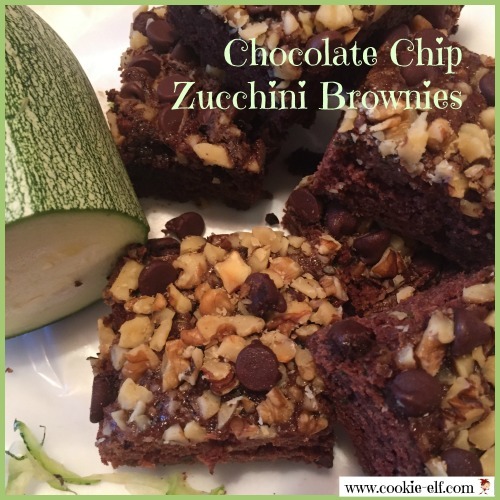 Measure 2 ½ cups of the grated, drained zucchini and set it aside. Set butter and granulated sugar in a large bowl. Use an electric mixer on medium speed to combine the ingredients together. Add eggs, one at a time, followed by the vanilla extract. Beat the mixture until it is smooth. Add flour mixture and blend until the batter is just combined and dry ingredients are absorbed. The batter will be quite thick, resembling heavy, wet sand. Fold in grated zucchini, either with a large spoon or on the mixture’s low setting. Pour the brownie batter into the prepared pan. Use an angled spatula to spread the batter evenly in the pan. Sprinkle the surface with the chopped nuts and chocolate chips. Bake the brownies for 25-30 minutes until set and a toothpick inserted in the center comes out clean. Do not over bake. Remove brownies from the oven and allow the pan to cool completely on a wire cooling rack. To make very thick brownies, use a 9 x 13 pan. Increase baking time to 45-50 minutes. Brownies will cut more evenly if you set them in the refrigerator to chill for about an hour. Get more ideas for brownies on our Brownies Pinterest board.